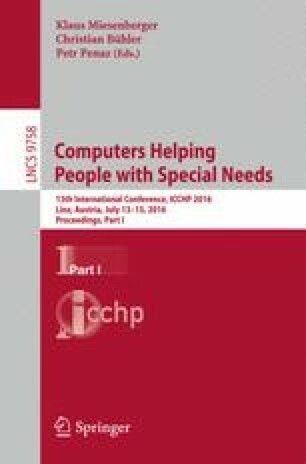 Accessibility functions on touchscreen computers improved user experience of people with visual impairments. Regardless of this situation, they have some problems using touchscreen interfaces including smartphones and tablets. The reason includes the arrangements of accessible objects may differ for visually impaired users because of the manipulations under screen readers are different from those without screen readers, the characteristics of desired object sizes and arrangements on the touchscreen computers for the visually impaired remain unclear. The purpose of this research is to find a way for the visually impaired to accurately and efficiently manipulate the keyboard. This study especially seeks to find the optimum conditions for the number and sizes of buttons (including the area) for the visually impaired. For this purpose, we developed an experimental application. This work was partially supported by JSPS KAKENHI Grant Numbers 26285210, 15K04540, and 15K01015. We are also grateful to the students of the Tsukuba University of Technology for their great help.